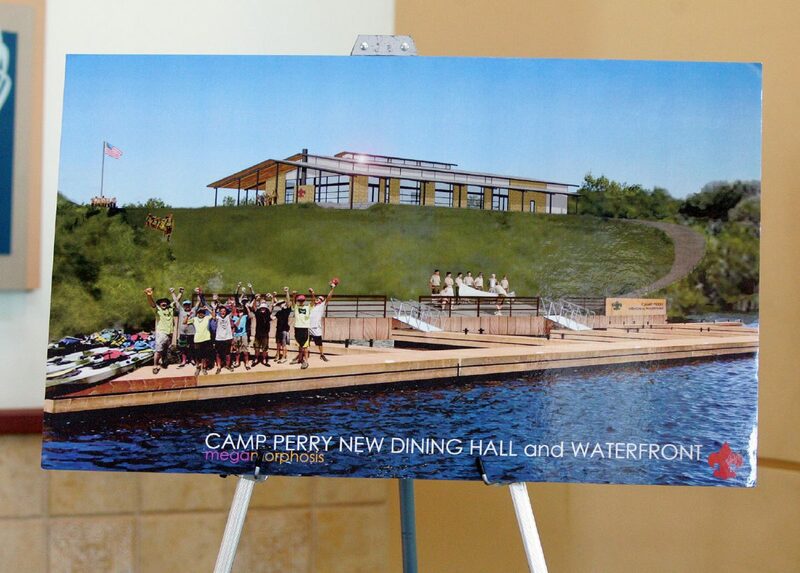 A photo rendition of the new dining hall and waterfront is on display at the Camp Perry Celebration Kickoff at the McAllen Convention Center September 7, 2017in McAllen. HARLINGEN — They told Terry Fossum’s father his three sons would never achieve anything. Terry Fossum became an officer in the U.S. Air Force. His brother is a dentist. And, the other brother, Michael Fossum? Well, he’s an astronaut. They attribute much of their success to scouting, and many of those hours in scouting were spent at Camp Perry. 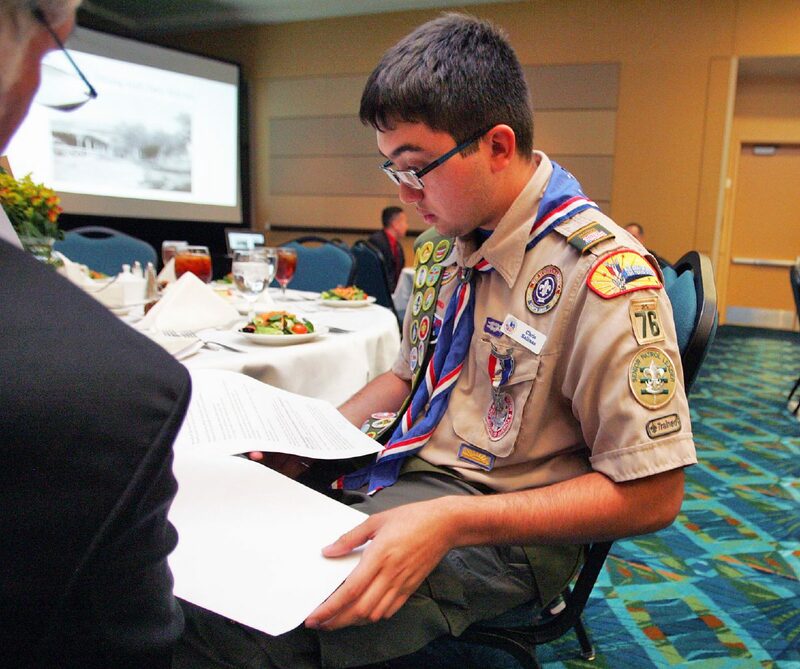 Boy Scouts Troop 76 Senior Patrol Leader Chris Salinas prepares to speak during a Camp Perry Celebration Kickoff at the McAllen Convention Center on September 7, 2017, in McAllen. Rev. 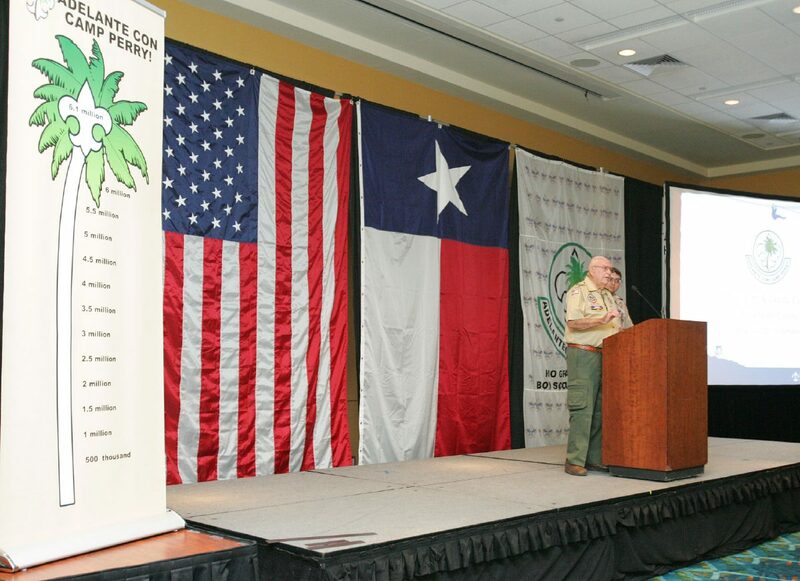 James Gebhart speaks during a Camp Perry Celebration Kickoff at the McAllen Convention Center on September 7, 2017in McAllen. 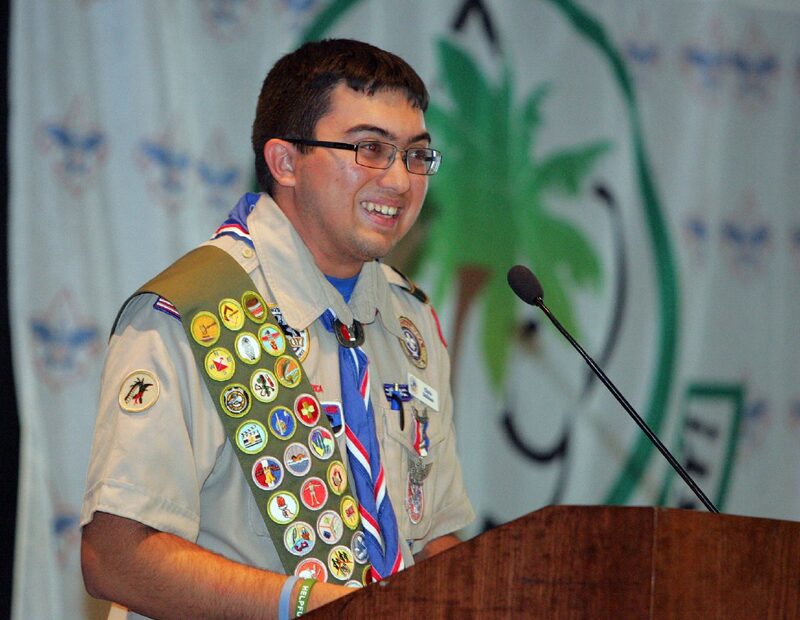 Boy Scouts Troop 76 Senior Patrol Leader Chris Salinas speaks during a Camp Perry Celebration Kickoff at the McAllen Convention Center September 7, 2017in McAllen. The Rio Hondo Camp — the oldest continually-operating Boy Scout camp in Texas — is almost 100 years old now. And as expected, age has taken its toll and the facilities have fallen into disrepair. That’s why the Fossums and other leaders of the Rio Grande Council traveled around the Valley throughout the day yesterday to help kick off an effort to raise more than $10 million. So far, the council has pledges and challenge grants totaling $5.3 million. The Rio Grande Council still has work to do to reach the $6.1 million figure, which will be used to revitalize and expand Camp Perry. More than 600 interested citizens, ex-scouts and community leaders turned out for the campaign launch — called Adelante con Camp Perry! It was about a year ago that following a feasibility study, the board of the Council authorized the campaign effort. Thursday, the effort was officially launched at a breakfast in Brownsville, luncheon in Harlingen and dinner in McAllen. The reason, to talk about the details of the plan to the public and beyond. One thing is for sure, there’s already a list of projects planned with drawings and plans in the works. Those include a new dining hall, health and fitness center, new waterfront, archery range, shooting range and swimming pool. Additionally, new roads, new campsites and even an ATV/BMX course are a few of more than 20 different improvements planned to be made. While the facilities at Camp Perry are still in active use, fewer scouts are using them. One of the problems is the dining hall. In years past, visitors were happy with an open air dining hall. These days, people look for a place to escape the heat. Overall, people are traveling elsewhere for scouting activities. If they can’t afford it, they don’t go. “We want scouts to stay here,” Terry Fossum said. His brother Michael Fossum, an astronaut, for whom a middle school has been named in McAllen, also encouraged the raising of funds for Camp Perry. When scouts first begin camping there and earning merit badges, he said, they don’t fully comprehend the value of the experience. “When they get older, then they get to understand the good it’s done,” he said. He recalled many nights and days of camping, seeing nature in its process, raccoons, possums and the constellations slowly turning over head, constellations he’d one day move toward a little closer from his tent.